World Cup final Match preview: Germany vs Argentina, team news, stats, possible lineups, prediction by junaid, head to head, form guide. Germany and Argentina are ready to face each other in another World Cup final tonight in Rio de Janeiro. It will be the third World Cup final between these two sides. Germany will play their eight World Cup final more than any other country. While Argentina will play their fifth World Cup final. Argentina are unbeaten in their last five games. For Germany, center Back Mats Hummels is expected to start despite of the minor injury he suffered against Brazil. Meanwhile, Argentina winger Angel di Maria is still a doubt due to a thigh injury. But Manchester City striker Sergio Aguero has returned and will hopefully be in the starting eleven. While full-back Marcos Rojo has an ankle injury but is expected to be available tonight. Messi has been a vital player for Argentina so far in this competition and is ready to play another important role tonight as he wishes to fulfill his dream by lifting the World Cup trophy. He has scored 4 goals and needs 3 more to beat World Cup top scorer James Rodriquez who is still on top with 6. 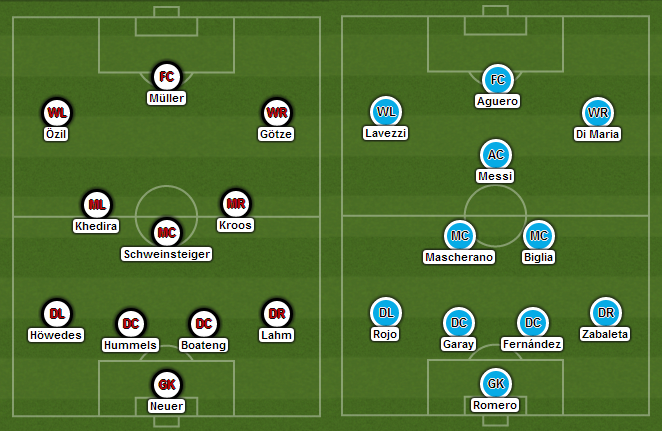 Germany 2 – 1 Argentina, a difficult one to predict. Lionel Messi will play a vital role once again but Germany will hopefully lift the World Cup trophy for the fourth time in the history of football.